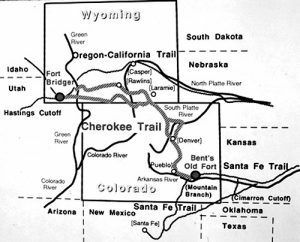 The Cherokee Trail was a historic overland trail through the states of Oklahoma, Kansas, Colorado, Wyoming, and Montana that was used from the late 1840s up through the early 1890s. The route of the trail ran from the Grand River near present-day Salina, Oklahoma, northwest to strike the Santa Fe Trail at McPherson, Kansas. From there it followed the Santa Fe Trail west, then turned north along the base of the Front Range of the Rocky Mountains in Colorado, over the old Trapper’s Trail, to the Arkansas/Platte River divide and descended along Cherry Creek into the South Platte River. In Colorado, the original 1849 trail followed the east side of the South Platte River to present-day Greeley then west via a wagon road to Laporte in Laramier County. From Laporte, the wagon road was built north past present-day Virginia Dale Stage Station to the Laramie Plains in southeastern Wyoming. The trail then proceeded to the northwest around the Medicine Bow Range crossing the North Platte River before turning north to present day Rawlins, Wyoming. From there, the trail meandered west before finally joining the Oregon, California and Mormon Trails near between modern-day Farson and Fort Bridger, Wyoming. Hearing of the discoveries of gold in California many of the Cherokee Indians were enticed to the gold fields to seek their fortunes. According to the Cherokee Advocate’s March 19, 1849 edition, “men who were worth only a few dollars are worth thousands within a few months of their arrival to California.” The rumors and dreams of gold prompted one Cherokee named Lorenzo Delano to sell his land in order to travel to California. The sale of his property was listed in the Cherokee Advocate. He was not alone in selling everything he owned on the Cherokee Reservation and heading west. The route was established in 1849 by a wagon train headed to the California gold fields. 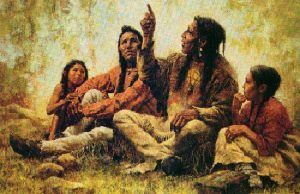 Among the members of the expedition were a group of Cherokee Indians, hence the name of the trail. The wagon train was comprised of a group of white settlers from Washington County, Arkansas and a number of Indians from the Cherokee Nation. The emigrants left Arkansas on April 24, 1849. Once they arrived in Tahlequah, Oklahoma and were joined by a number of Cherokee Indians, they gathered to establish rules and elect a leader. Lewis Evans, a former sheriff of Evansville, Arkansas, was elected Captain, so this expedition is often written as the “Evans/Cherokee” Train. The company who called themselves the “Washington County Gold Mining Company” consisted of 130 people and 40 wagons. They were the first wagons over explorer, John C. Fremont’s Trail in the area and were using his journals. 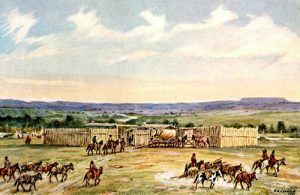 The wagon train followed a trail along the Front Range of Colorado then turned west along the Colorado/Wyoming Border toward Fort Davy Crocket. At this point, they stopped following Fremont’s directions and blazed the Northern Cherokee Trail south of Elk Mountain in Wyoming and then across the Red Desert to Fort Bridger. 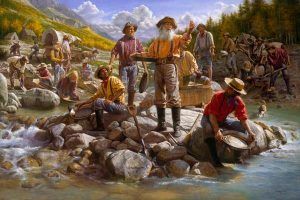 Despite the warnings, the year 1850 marked the beginning of the continuous use of the Cherokee Trail by gold seekers, emigrants and cattle drovers from Arkansas, Texas, Missouri, and the Cherokee Nation. Further use of the trail was made by travelers who wanted to avoid the cholera epidemic which ravaged the travelers following main trails. That year, four separate wagon trains of white settlers and Cherokee Indians would make the trek along the Cherokee Trail. In one of those wagon trains, was a Cherokee man named John Lowery Brown who kept a diary of their journey. 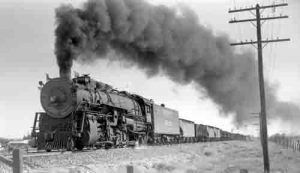 The wagon train left Salina, Oklahoma on about May 22nd. Several days later they came to the Santa Fe Trail and turned west along the Arkansas River. 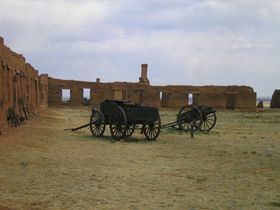 Passing the remains of Bent’s Fort in Colorado, the train continued west to Pueblo where they traveled north along the east range of the Rocky Mountains. Near present-day Denver, the group took a more direct route than did the Evans party of the prior year who had continued northerly along the east bank of the South Platte River. Ralston was an Irishman whose wife, Elizabeth Kell, had Cherokee ancestry. Ralston and his brother-in-law, Samuel Simons, had left Georgia in early 1850 hoping to gain wealth in the west. When they arrived in northeastern Indian Territory they joined the Cherokee wagon train headed for the gold fields. After Ralston had announced his gold find, he was quickly joined by a number of other members of the train but only a few flakes could be found. In the end, they concluded that the California gold would be richer. 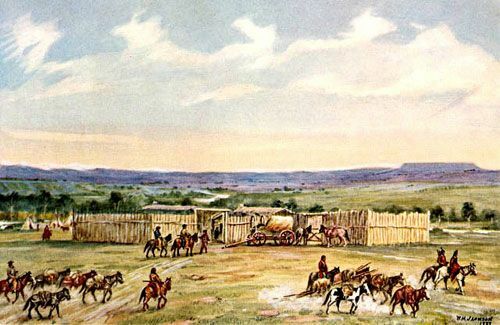 The emigrant party then proceeded north to Laporte and onto the Laramie Plains where they turned west along the Colorado/Wyoming border via the Fort Davy Crockett Trail to Fort Bridger. 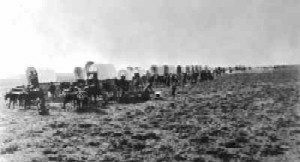 The lead wagon company blazed the road from Tie Siding to Fort Bridger. The changed route then became known as the Southern Cherokee Trail. The wagon train completed its journey, arriving in California on September 28, 1850. Both the northern and southern routes of the Cherokee Trail were heavily used but neither went over Bridger Pass, as it was not open for wagons or used by the military until 1858. At that time most wagon trains utilized a variation of the Evans 1849 trail which included Bridger Pass. In addition to gold seekers making their way to California, several military commands also followed the Cherokee Trail. Captain Randolph B. Marcy used it as a return route after he had journeyed through Colorado’s mountains from Fort Bridger to Fort Union New Mexico in the winter of 1857-58. Eight years after he had made his trip to the California Goldfields, Lewis Ralston, of the 1850 Cherokee Trail party, returned to “Ralston’s Creek” with Green Russell. Members of this party founded Auraria, which was later absorbed into Denver City in 1858 and touched off the 1859 Colorado Gold Rush. The confluence of Clear Creek and Ralston Creek, the site of Colorado’s first gold discovery, is now in Arvada, Colorado. In the 1860s portions of the trail from northern Colorado to Fort Bridger in Wyoming were incorporated as part of the Overland Trail and stage route between Kansas and Salt Lake City, Utah. 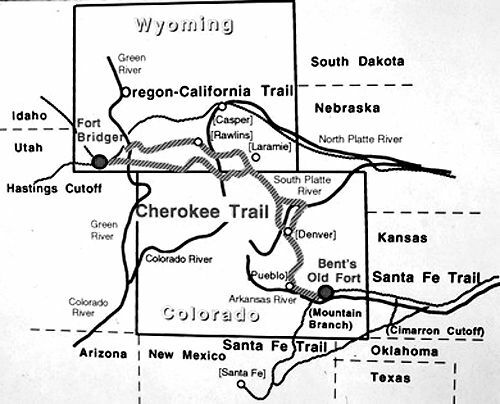 At this time it was called the Cherokee/Overland Trail. 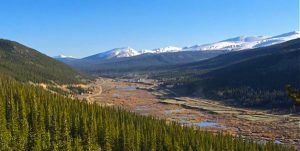 During the Civil War, the Cherokee Trail was the recommended route between Denver and the Montana gold fields. The Rocky Mountain News told travelers to take the Cherokee Trail from Denver north and then follow the route west to Fort Bridger. There, travelers were advised to head north to Fort Hall, Idaho, then travel the remaining 200 miles to the mines. The outlaw L.H. Musgrove traveled on the Cherokee Trail from Colorado into Wyoming during the 1860s. By 1868 the Union Pacific Railroad had laid its track all the way across southern Wyoming. With this railroad completed, the emigrant trails began to lose their significance and freight roads emerged to serve areas south and north of the railroad. 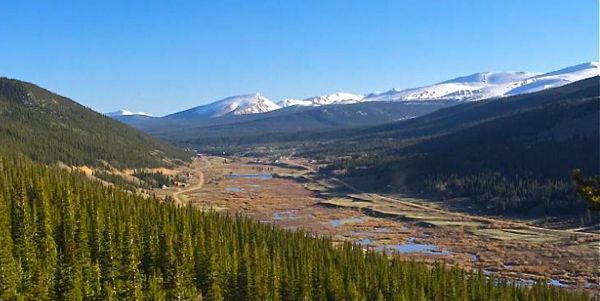 By 1868 the only roads remaining in northwestern Colorado led to Wyoming. Today, wagon ruts, swales and cut down ravines and river banks can be followed. today in some segments and sites from Fort Gibson/Tahlequah, Oklahoma, through Kansas, Colorado, and Wyoming to Fort Bridger, Wyoming. In Colorado, parts of the trail are still visible and walkable in Arapahoe, Douglas, and Larimer counties. An approximation of the route can be driven on State Highway 83 from Parker near Denver to Colorado Springs. Other parts of the old trail can be seen on Bureau of Land Management land in Wyoming. In Sweetwater County, the trail is marked with four-foot high concrete posts. Were you looking for The Cherokee Trail of Tears ?